But even if the Senate votes to fix the funding formula by Tuesday – Medicare payments will be cut by 21 percent then if Congress does not act – it will not be the end of the fight for rural hospitals, administrators say. Those hospitals have been closing at an alarming rate in recent years, with experts blaming a changing health care climate, multiple cuts to Medicare and some states’ failure to expand Medicaid. Replacing the “doc fix” is just one of many issues those facilities face, said National Rural Health Association CEO Alan Morgan. Since 2010, Morgan said, 48 rural hospitals have closed their doors – including two in Arizona – and 283 more hospitals nationwide are at risk of closing. 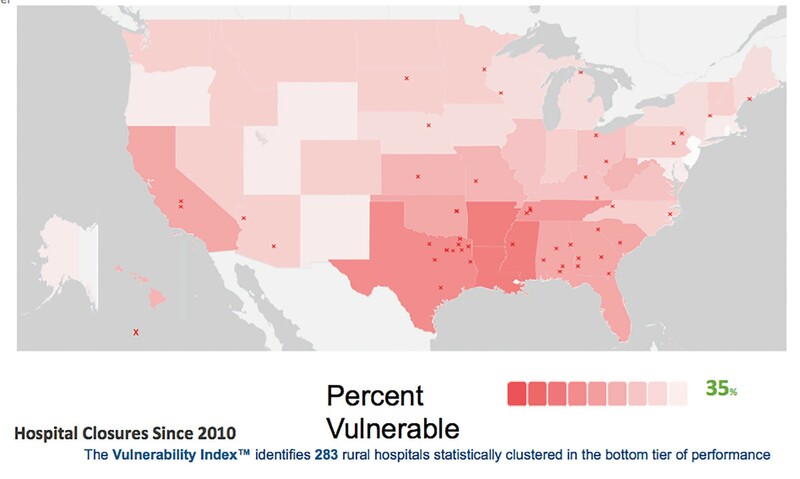 Critical-access hospitals are those with 25 beds or fewer, most of which are in rural areas. Arizona’s rural hospitals have been largely resilient in the face of Medicare cuts, in part because of the state’s voter-approved 2001 ballot initiative that expanded Medicaid, and because of early expansion of Medicaid under the Affordable Care Act. State lawmakers this month approved a state budget for fiscal 2016 that cut Medicaid by 5 percent. While that cut is estimated to result in direct savings of $127 million, advocates said repercussions in the healthcare industry are much larger. Rural residents have higher rates of hypertension, obesity, alcohol abuse, suicides, and fatal and serious-injury accidents, among other health-related issues. But providing them health care is challenging. Rural hospital closures also have a ripple effect in their communities, often leading to the shutdown of other health-related facilities like pharmacies and nursing homes, and even driving out private practice physicians. Patients living in rural areas have no choice but to drive hours or delay medical care when their community hospital closes, and physicians fear that even the smallest change to the bottom line could push several rural Arizona hospitals over the edge. “Any one of these threats as they play out could create a tidal wave that washes over them and puts them out of business,” Derksen said. The current doc fix bill expires Tuesday, meaning Medicare payments for services performed from Wednesday on would be cut 21 percent. The House voted Thursday to make the fix permanent, and head off those cuts, but Senate leaders said early Friday they do not plan to take up the measure until after they return from a two-week recess. Because it takes two weeks to process payments, senators believe they will be able to act before health care providers feel any cuts. If they don’t act, the 21 percent cut to Medicare payments kicks in. And rural hospitals would be forced to absorb increased costs. Lawmakers have passed temporary fixes 17 times since 2002, but Morgan is hopeful for the permanent solution advanced by the House Thursday. That measure passed 392-37 with an unusual degree of bipartisan support – just 33 Republicans and four Democrats voted against the bill. Forty-eight rural hospitals, marked by an X, have closed since 2010, says the National Rural Health Association. It says 35 percent of the remaining rural hospitals are vulnerable to closure, with states that are more red at highest risk. Rural health care is buffeted by several trands, including a changing health care climate, a falling patient base and funding cuts that advocates say have left about a third of rural hospitals at risk.